That is a LOT of machinery! ...in the Buckhorn hotel room! What is it all for? When they are asking Diane about that night with Dale, I thought for a moment that it was monitoring her, some kond of lie (or SOMETHING) detector. But just for a moment. And I hope they tipped the hotel staff handsomely. Gordon, Albert, Tammy and (certainly) Diane die NOT carry all that! Good question. They definitely have their own little "command" center going on there.Portable FBI office? I thought I was a heavy packer! Initially I thought that there must be some Junior FBI people who carry all that stuff for them, but then we never see anyone else on the plane. Maybe it's some local FBI who meet them and then help them get all their stuff set up. It seemed like a comically large amount of tech. Maybe a nod to the doughnut scene/s from the first run. Instead of tables full of doughnuts, in the modern command center there are mountains of tech. It would be fun to see them wheel all that into the Twin Peak's Sheriff's Office conference room. And, I like Murat's answer. Took it as Lynchian irony, commenting on the impotence of information technology & law enforcement agencies. And, as a reversal (though both observing evil) of the similar stacks in the NY glass-box-portal room. They're also stuck now in Buckhorn apparently. How's all that crap gonna fit on that small jet (had to have been helicoptered in)? Haha. Well, Albert is the forensics guy. And he don't suffer podunk backwoodsie facilities. Maybe it's all to give Major Briggs his due and proper analysis. 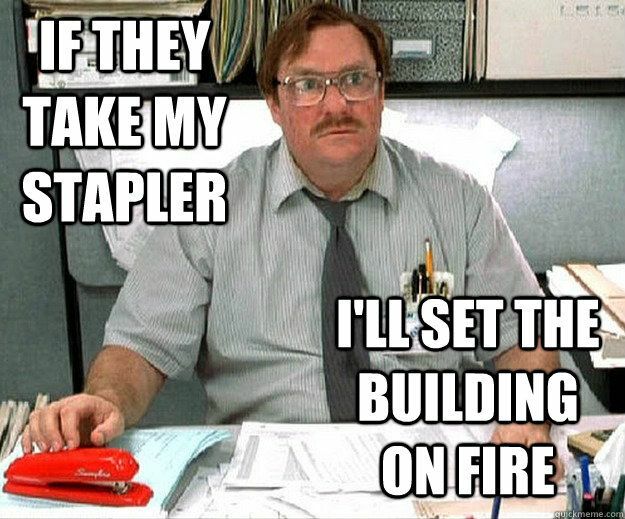 Looks like someone stole the stapler. It's a cassette deck! Quadrophonic! Equipment? Pah! That's nowt. You should see what our keyboard player insists on dragging around. Mind you, he is the musical director, stage sound engineer and recording guru. Or was, until he relocated to Bulgaria. I think I have an old cell phone lying around that looks like that. I use it to threaten my son (here, you can use THIS one! ).